It’s a widely-known rule of thumb within the four walls of my living room that adding zombies or monkeys to an entertainment property can practically guarantee success. Or perhaps you haven’t heard of the best-selling Marvel Zombies series (super heroes + zombies) or the hilarious trunk monkey (car ads + monkeys)? As my friend Paul of Toy Bender pointed out when he discovered this Mouse-shaped atrocity, this is the same sort of lazy, ill-conceived product strategy that leads to tripe like Goofy as Jar Jar Binks. Evil toy-producing masterminds Takara will also release a version of this horrifically-cheery monstrosity in an ashy-gray version to match the color of my incinerated, formerly-fond childhood memories. I dunno, to me the Goofy/Jar-Jar mashup really just exposed the inanity of both. But, I always was more of a Bugs Bunny guy than a Mickey Mouse guy. Hah – judge all you want, snark-boy: I think it’s cute. Your whooshing sounds and evil glares will not deter me! 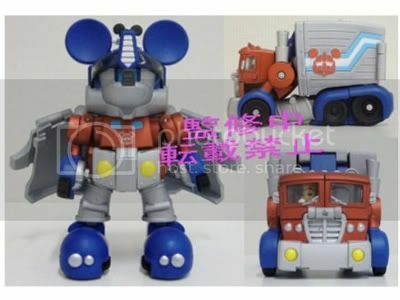 @Jeff Sparkman: Nah, since it’s from Takara-Tomy, it’ll probably be something like Mickey Convoy. Previous post: Geek Steal: Family Guy – The Complete Collection for 65% off!